(KZN.RU, February 7, Ksenia Shvetsova). Every third resident of the residential complex “Salavat Kupere” is younger than 16 years old. Therefore the creation of conditions for a comfortable life and development of the young population of the neighborhood is one of the most important tasks today. 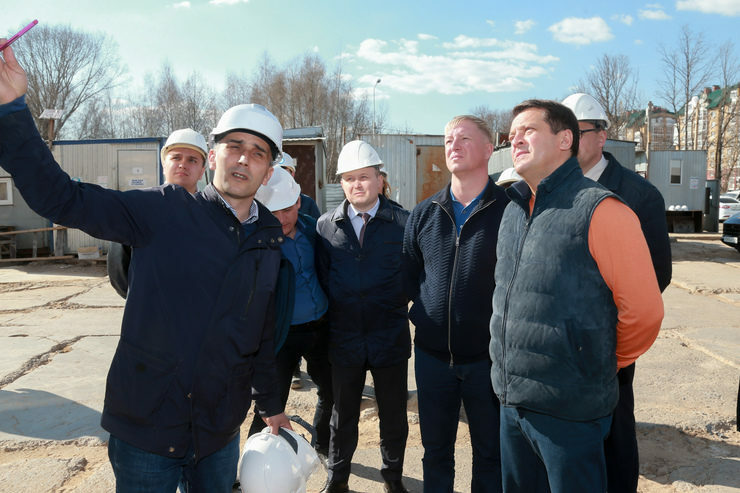 Ilsur Metshin, the Mayor of Kazan, announced this today during the inspection of new social facilities that recently opened their doors for local residents – the teenage club “Impulse” and a branch of the children's polyclinic №4. The teenage club “Impulse” opened in the residential complex “Salavat Kupere” at the beginning of the school year. The total area of the building is 300.5 square meters. According to Evgenia Sabirullova, the club director, it is visited by 520 people aged from 2 to 62 years. “The club is very popular. We have a very functional club, we try to fill every hour with work, from early morning to late evening. A lot of children, young mothers, schoolchildren, pensioners come to us. In our area, there are a lot of young families, mothers, and small children. And so far, there are no other similar institutions, so it was a great gift for the population”, said E. Sabirullova. Creative sections are organized in the institution: visual arts, scrapbooking, sports karate, boxing, gymnastics and rhythmic gymnastics, developing classes for very young children, various dances, as well as classes for preparing children for school, and English courses. “We also have a theater group in Tatar, where classes are conducted by Kamilla Galeeva, an actress of the Tinchurin Theater. We often stage various Tatar performances, invite guests. This year is the year of the theater, so we are paying so much attention to this area”, said the club director. The “Impulse” has an almost family vibe: while the kids study with teachers, young mothers do fitness and dancing, and at the same time they can watch their children. In the morning, classes are conducted mainly for toddlers and young mothers. Ilsur Metshin attended an art class for children from 5 years old. “There are five children in our family, four of them visit this club. We are very grateful to you for this opportunity”, said local resident Maryam Kitaeva to the Mayor. She told about the project, which is being implemented on the basis of the club on her initiative. “There are a lot of young families and women on maternity leave in “Salavat Kupere”. And I myself, being on the leave for 8 years, understand what it is like. I organized the project for young mothers “Mother Flowerbed”, weekly free events where women communicate, rest, and develop. For example, we invited a make-up artist, a psychologist, organized a concert”, said M. Kitaeva. Local residents conduct classes on a voluntary basis. “It's great that you have found yourself such an interesting thing, this is a very good initiative. Thank you”, said the Mayor. “Every third resident in the “Salavat Kupere” is younger than 16 years old. Thus, creating conditions for young people and the development of children is one of the most important tasks for us today. Adolescent club in the community is very important”. In a conversation with his parents, the head of the city asked if their children went to kindergarten. “We have not yet entered kindergarten, there were no vacancies”, answered one of the mothers. “We will solve this problem soon. Now two new kindergartens are being built in “Salavat Kupere”. We hope that this year the work will be completed, we are looking forward to this”, noted the Mayor. Then Ilsur Metshin visited the branch of the children's polyclinic №4, which opened recently at Zarechie Prospect, №28. The new premises of 360 square meters completely occupy the first floor of a 17-storey building. Niaz Galeev, the Ph. D. of Medical Sciences, the head doctor of the polyclinic №4, said that the branch structure includes 2 medical reception rooms, an ECG room, a blood analysis and biomaterials collection room, a doctor’s duty unit, a filter, a baby milk supply station, a vaccination room, and ancillary facilities. Reception is conducted by 2 doctors, which allows organizing work in 2 shifts before and after lunch. “This is the most demanded branch of those that we opened. Today, 1607 children are served here, of whom 262 are children under one year of age. This is 16% of the total number of children living in the residential complex. For comparison, we have 25621 children in the clinic, 1608 of them are children under one year old, and this is only 6%. This indicates how young the population is here”, noted Niaz Galeev. The Mayor examined the patient reception rooms, as well as the filter box room, which is open throughout the working day. Parents with children with fever or rash can go in through the separate entrance here. Separately, the clinic allocated premises for the breastfeeding, where there is a sink, changing table, microwave oven. “When a child is sick, mom is already in a stressful state, she needs comfort. And here it is cozy, the air is purified and heated to the required temperature, all standards are fully met”, said the head doctor of the institution. He also added that the staff includes the polyclinic’s own internal reserves. Today there are 2 doctor shifts, 6 nurse shifts, a receptionist, a cloakroom attendant, a cleaner, and others. “This schedule is not enough to provide full medical care. Now with the Ministry of Health of the RT, we are deciding on the allocation of additional shifts”, said N. Galeev. “When we met with citizens, there were a lot of appeals about the lack of a children's clinic. They were forced to go to Yudino, we even organized the bus. And now doctors are within walking distance for the residents of “Salavat Kupere”. This is a very important event”, said I. Metshin. At the end of the visit, the head of the city talked with the visitors of the medical institution and wished them good health. Sergey Mironov, the head of the Kirovsky and Moskovsky districts’ administration, Ilnur Khalfiev, the head of the Health Department of the Ministry of Health of the RT for Kazan, Airat Faizov, the chairman of the Committee on Children and Youth Affairs, and others took part in the inspection of new social objects.